Henry is an athlete. To him, playing sports is better than ice cream and the circus and probably ice cream at the circus. When a basketball challenge comes from a kid dubbed Tough Guy, Henry can’t back down. This kid, this Tough Guy, thinks he can squash me like a bug? And he thinks he and his friends can beat me and my friends in a basketball game? “We challenge you. Tomorrow. Right here – three o’clock,” challenges Henry. “Your funeral,” responds Tough Guy. When the rematch rolls around, Tough Guy’s mom comes…to be the referee. Tough Guy’s cousin is subbing for a missing player. The new player is…eh-hem…a fifth grader. A six-foot tall fifth grader who needs a shave. The rematch doesn’t go very well for Henry. His team, the Basketball Bats, do all they can to compete, and unfortunately, Henry even tries to do it himself, ignoring his teammates. Not wanting to out-cheat the cheaters, Henry comes up with a way to outsmart them. But will his plan work? Can the Basketball Bats win the tiebreaker? Will his teammates even want to play with him anymore? 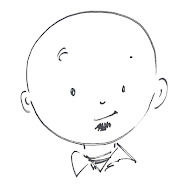 All is nicely resolved and without telling exactly how, I will say that young readers will be satisfied. Gym Shorts is a new series by Betty Hicks. 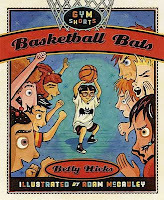 Basketball Bats, the first book, introduces readers to the five main characters – Henry, Goose, Jazz, Rita, and Rocky. These five athletes all live on the same street, all have their own individual talents, and always encourage and help one another find success. Three other Gym Shorts books have been released (reviews to come) and more titles are on the way.